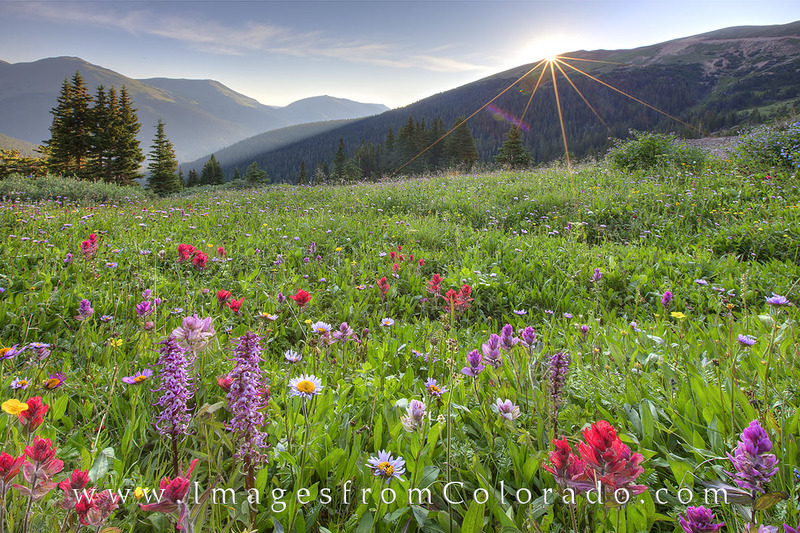 As Colorado wildflowers begin to show up in the Rocky Mountains, I look forward to some colorful and scenic vistas. As I make my home base in Winter Park and the Fraser valley, I usually start in this area. Some of my favorite sites around here are on the slopes of Rocky Mountain National Park and along Berthoud Pass. From high atop the tundra of Trail Ridge Road, sturdy sunflowers commonly known as Old Man of the Mountain add splashes of yellow and gold to the high grasses. In the evening, you can often catch the sun setting behind the rocky peaks with these wildflowers in the foreground. The same type of scene can be found on the slopes of Berthoud Pass, except this location is better (in my opinion) for sunrise. This requires a pretty early start time, but the views of the valley below and Vasquez Ridge are worth the extra effort. Along Highway 40 as it drops from the summit of Berthoud Pass into Winter Park, several creeks funnel melting snow down the mountain. Colorful flowers grown along these wet areas and often produce stunning scenes. On the trails, macro lenses can be used to capture close ups of the state Colorado wildflower, the Columbine, as well as wild roses. 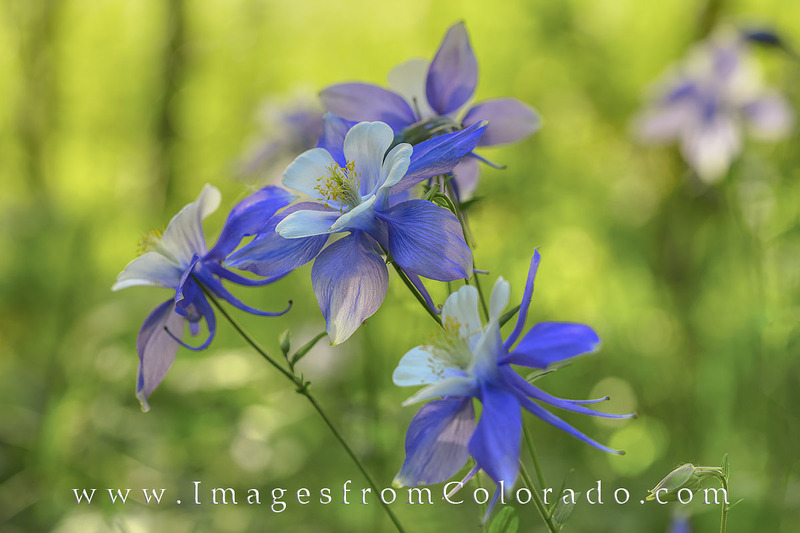 Columbine, Coloradoâs state wildflower, shows off its delicate blue and white petals in the morning sunshine. On the other side of Berthoud Pass, a hike up Butler Gulch rewards a 2 mile uphill slog in June with a meadow of wildflowers, including bistort flowers, red and yellow paintbrush, elephant flowers, bell flowers, blue flax, columbine, and many more. I like to visit this area at sunrise to capture the sun’s first light as it breaks over the peak. Paintbursh, daisies, elephant tusks, and many other colorful Colorado wildflowers adorned the meadow near the top of Butler Gulch. The sunlight was a welcome addition to the morning air as it was cold on the July morning, but the vibrance of summer blooms made the 2 mile trek in the dark to this point well worth the effort. It is usually cold with a lot of dew on the ground, so I wear waterproof everything – and most times I still can’t feel my fingers by the time the sun shows itself! If you have any questions about these photographs of Colorado Wildflowers, please do not hesitate to contact me.